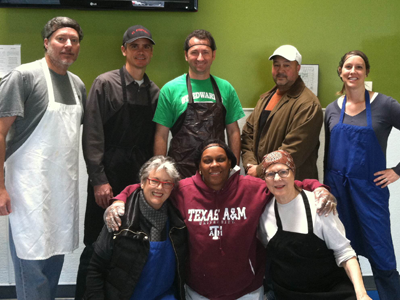 On January 6, the faculty and staff of St. Stephen’s Episcopal School, Austin, participated in a day of service by volunteering at a wide variety of organizations across Austin. From sorting thousands of pounds of food donations, spreading more than 24 cubic yards of mulch, creating art projects for youth and preparing hot meals for homeless people in the community, more than 100 St. Stephen’s faculty and staff lived into the school’s mission of serving others. Throughout the day, Crosby and his team painted the food pantry, washed multiple loads of laundry, helped prepare for an Epiphany service, cleared out recycling and trash, and prepared lunch for residents and staff. “Everyone really enjoyed the many work projects and our new acquaintances,” he said. Kathy Coe, dean of 9th and 10th grade students, was one of seven volunteers who braved an unexpected cold front and 16 degree weather to work at Down Home Ranch in Elgin. A working farm and ranch, Down Home Ranch is home to approximately 40 adults and children with Down syndrome and other disabilities. “We spent the morning spreading mulch and then spent some time in the afternoon cleaning out the greenhouse so they could lay down new flooring,” she explained. In addition to tackling some much-needed chores on our own campus, St. Stephen’s faculty and staff also volunteered at these organizations: Breakthrough Austin, which addresses low-income students’ unique academic needs and personal circumstances as they work to become the first in their families to go to college; Capital Area Food Bank, which distributes food and grocery products throughout Central Texas; Creative Action, a local organization that support the academic, social and emotional development of young people; Lifeworks, an affordable housing complex for low income families in Austin; Mary House, which offers free medically supportive housing to homeless, indigent adults with critical or terminal illnesses; and Texas Memorial Museum, a division of the Texas Natural Science Center that helps create awareness, understanding and appreciation of biological diversity in Texas. Although the service projects varied greatly, volunteers’ collective feelings about the day were of great excitement and gratitude. “Despite the intensity of the work, it was wonderful to have the opportunity to work together and to learn so much about, and from, the people and organizations we served,” FitzGerald said.